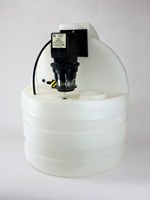 Chemical/mineral feed systems are among the most effective, versatile, and cost-efficient of water treatment devices. Depending on the chemical agent used, the same equipment can treat bacteria, iron, manganese, low pH, hydrogen sulfide (rotten egg smell), and many other water problems. A Stenner peristaltic pump is simple to install, operate, and maintain, and can be used for virtually any chemical or combination of chemical feeds. It can be used to feed chlorine or soda ash, for example, but is also capable of feeding hydrogen peroxide without losing its prime. 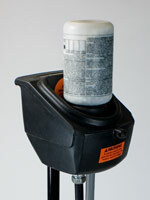 Well Pro dry pellet chlorinators offer some advantages over liquid chlorine-feed systems. They free you of the messy and unpleasant job of chlorine solution preparation, they're trouble-free and easy to install, and they often require no retention tank. Iron filters aren't ideal for landscape irrigation applications, where daily use of hundreds of gallons of water at high flow rates is common. Filters used in irrigation may be oversized, and multiple systems may be required. An alternative to filtration is iron sequestration. 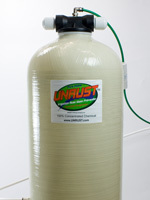 We offer the Unrust Iron Stain Preventer, an easy to install system that requires no electricity.